My friend and I had a very nice dinner last night. I didn't take any photos of my delicious vegetarian combination plate (think: grape leaves, spinach pie, hummus, baba, falafel, etc.) because I just happened to be seated next to one of the local television personalities in this area... and I didn't want her to think I was pulling out my camera to take a photo of her! LOL Despite that excitement, the biggest news of the night was that I asked my friend to be my maid of honor for my wedding next year... and she said yes! :) I'll be so happy to have her by my side; we've known each other since high school! Instead of sharing last night's dinner with you, I'm pulling out a dish I prepared a while back but never got the chance to blog about it. It's a Vegweb.com dish that's super easy yet delicious. 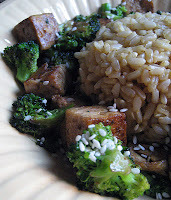 Titled "Lazy and Hungry Tofu Plus Broccoli" on Vegweb, this dish is simple and a quick dinner if you need something made in a short amount of time. The only change I made was that I used peanut oil because I didn't have sesame oil on hand. I chose to serve this with brown rice that I cooked using veggie broth instead of water. Deelish! Having someone special as your maid of honor makes all the difference. My sis was my maid of honor a month ago at my wedding, she definitely helped calme down my nerves! That tofu and broccoli sounds delicious! Yes a close friend as your maid of honour is very necessary on the big day. I must try the tofu and broccoli as it sounds very tasty.